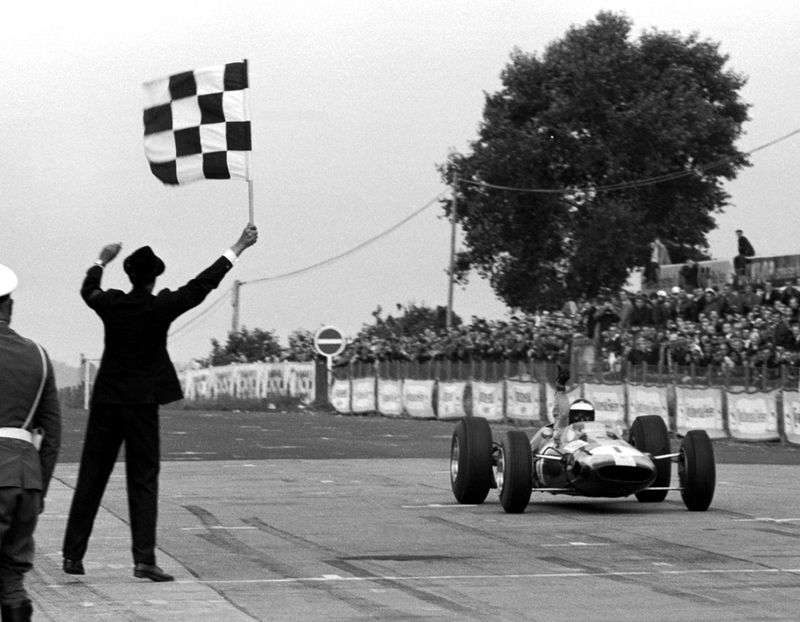 Jim Clark won the world championship in magnificent style with a flag-to-flag victory in the German Grand Prix at the Nürburgring. He started from pole, led every one of the tortuous 15 laps and scored his fifth consecutive win and second world title in three years. Honda had surprisingly withdrawn from the race as the firm was anxious to find out exactly why its car had suffered inexplicable power losses in its previous two grand prix appearances at Zandvoort and Silverstone. Sharing the front row with Clark were the two BRMs of Jackie Stewart and Graham Hill and John Surtees in the Ferrari. But it was Clark who sped away at the flag, taking a lead that he was never to relinquish throughout the 217 mile race. He broke the lap record repeatedly as he disappeared into the distance, eventually winning by over 15 seconds. The massive crowd of over 320,000 enjoyed a beautiful day for racing - sunshine, scattered clouds and blue skies. But it was not the most exciting of contests as Clark was so dominant over the twisting, plunging Eifel Mountain circuit, snaking through 172 corners - more than 10 to the mile. Surtees had trouble with the Ferrari gearbox, so wasn't able to mount a serious challenge, and Stewart had to retire after only two laps, as he damaged a front wishbone when he ran off course. Hill remained in second, but was unable to catch the flying Clark, and Dan Gurney in the Brabham Climax came home in third, only six seconds behind Hill. Jochen Rindt finished fourth to claim his first ever points, but the day belonged to Clark, the sheep farmer from Scotland who had blown away the competition in each of the six races he had started. "Nineteen sixty-five has truly been my greatest year in motor racing", Clark said afterwards. "Filled with unforgettable memories and the achievement of my greatest ambition - to win the Indianapolis 500-mile race and the world championship in the same year. For the rest of my life I will remember it as 'My Magical Year'."